Created: February 19, 2016 02:41 ; updated: August 02, 2016 18:14 . 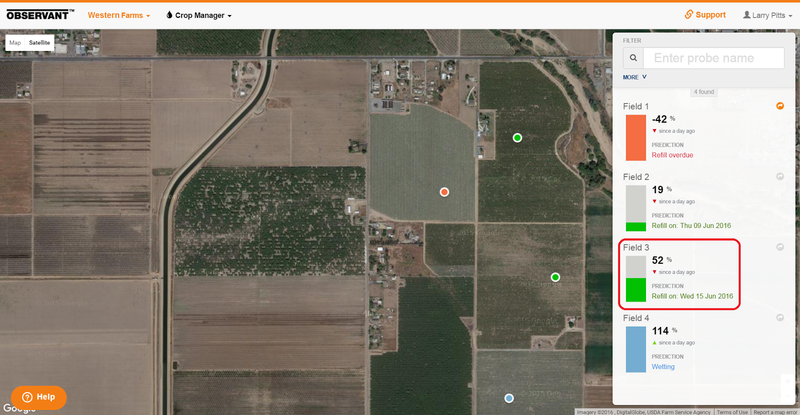 The Crop Manager Application provides users with a program for viewing, analyzing and interpreting soil moisture and other sensor data. Its numerous functions support timely, well-informed, irrigation and crop management decisions. As new features are incorporated, users are notified of the updates on the home screen of Observant Global. To use the Crop Manager Application, start by clicking on the Crop Manager icon. 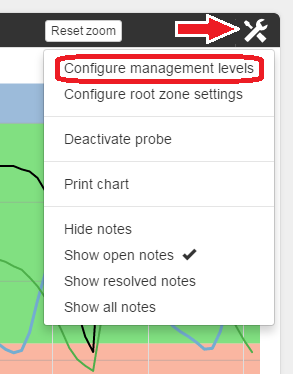 When you open Crop Manager Application, the Snapshot View of all probe sites is displayed as well as the current status of either the weighted average or the sum of the user-selected, root-zone moisture levels. The color-coded status of the site dots on the map are the same as their corresponding root-zone summary status-colors in the adjacent column on the right side of the screen. Since each telemetry field unit includes a built-in GPS, its position shown on the map is a very accurate display of its actual location. 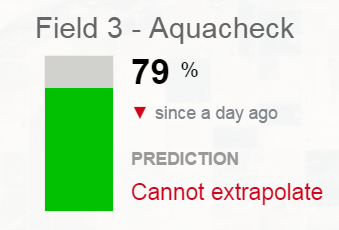 The site's status is expressed as a percentage. It is not the percentage of moisture content, however. Instead, it is a user-determined, weighted average (or sum) of moisture values measured throughout a soil profile at user-selected levels of a crop's root zone. A status of 100% indicates that soil moisture in the root zone has reached its 'Full' threshold, and 0% indicates that the root zone's soil moisture has declined to its the 'Refill' point. A value of 50% indicates the root zone moisture is midway between the two. Values over 100% indicate that the root zone is above the 'Full' threshold, and negative values mean that the root zone moisture has fallen below the 'Refill' point. The colors of the bars change according to the weighted, root-zone status and correspond to the site markers (colored dots) on the map. Color coding allows quick and easy assessment of current moisture conditions at all sites. The ability to quickly visualize the relative amount of soil moisture allows more efficient management of a crop's irrigation. 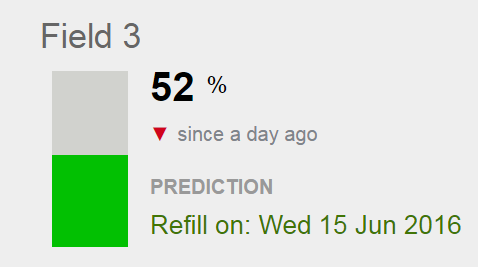 or increased (green ▲) over the past 24 hours. 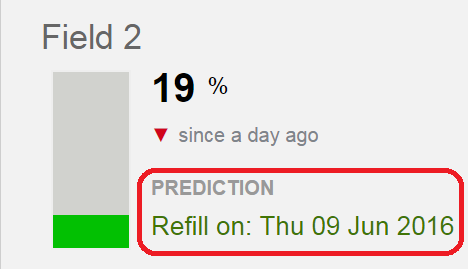 'Refill on' date, in green, indicates the day the root zone moisture will need to be replenished (assuming conditions remain as they have been in the previous seven days). 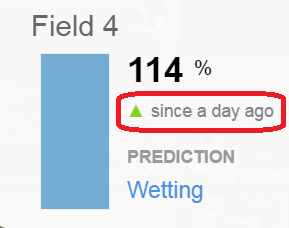 'Wetting,' in blue, shows the root zone has wetted over the previous 24 hours. 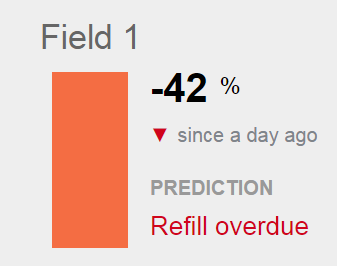 Should the root zone moisture fall below the refill point, the value will be displayed as Refill overdue with an orange bar. Once the moisture level has dropped to the plants' stress level, the Refill overdue warning turns from orange (seen here in Field 1) to red (as occurred in Field 3 earlier in the season). 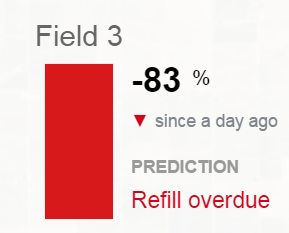 If the rate of depletion is very slow (as after a significant rain or irrigation event—when the profile is saturated), the PREDICTION date isn't useful, and Cannot extrapolate is displayed in red as is seen here in a different part of Field 3. 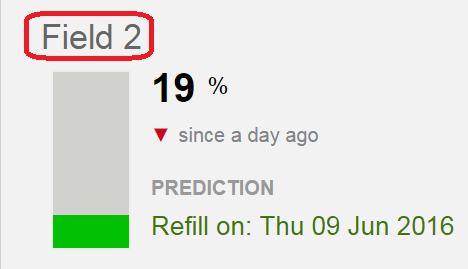 Note that if the cursor hovers over the status percentage, the current soil moisture value is displayed (typically expressed in relative Moisture Units, MUs) as well as the value at which Refill would become appropriate. Even if there are a large number of sites being monitored, a specific probe can be quickly located and its status displayed by entering the its name, or its number, or even just part of its name in the text box shown here. Click the down arrow next to MORE, and a series of filters become available. Then, with a single click, it is possible to see the status of all the probes in a specific category. To open the graph view for any site, just click on the site's name. 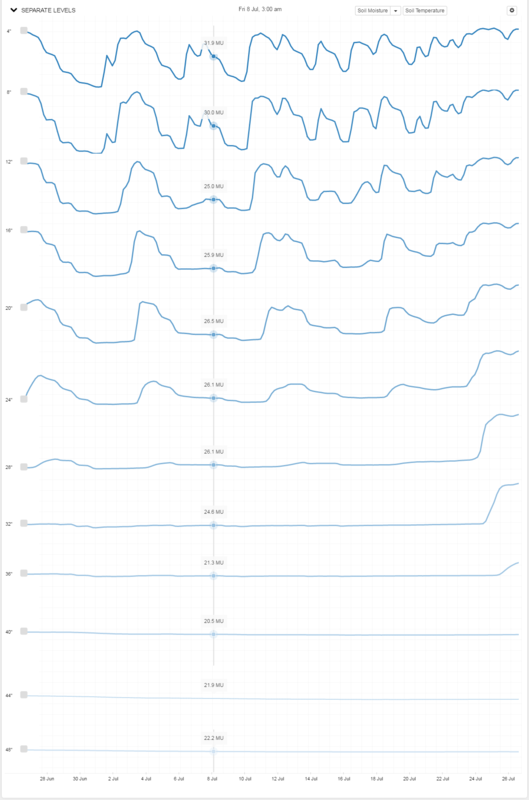 In the graph view, there is a range of features that can be applied to the charts for setting weighted-average root-zone depths, setting management levels, viewing separate level charts, setting date ranges and zooming and panning. One can even add additional sensors. You can also quickly display data from different sites within this portfolio by using the drop-down menu available in the upper left of the screen. 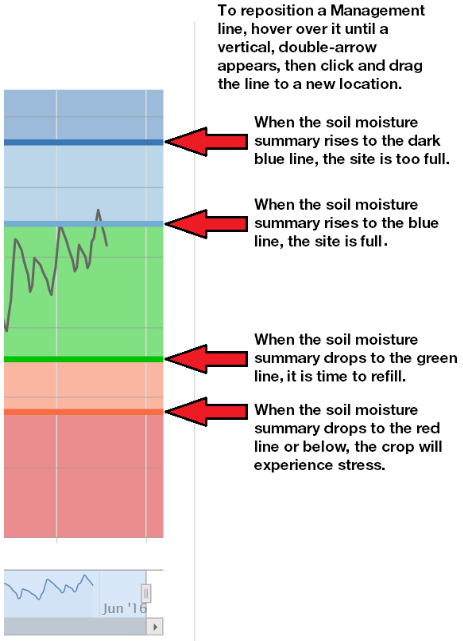 When you first open a chart to view the soil moisture data, there are a few things that you will need to set up and configure to allow the charts to be viewed and used correctly for making management decisions. These include setting up the root zone of the crop in which the probe is installed, setting up initial management levels, and scaling of the chart appropriately. 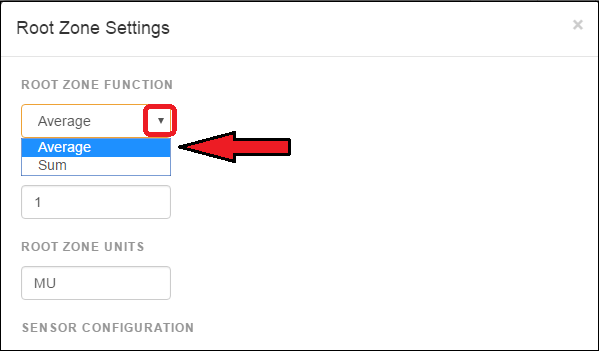 To select a particular configuration option, click on the tool icon in the upper right corner and choose from the resulting drop-down menu. Show or hide various notes you may have added to a chart. Show or hide separate sensor levels. When you select Average, the calculation used to determine root zone status is based on the weighted average of the outputs of all selected sensors. 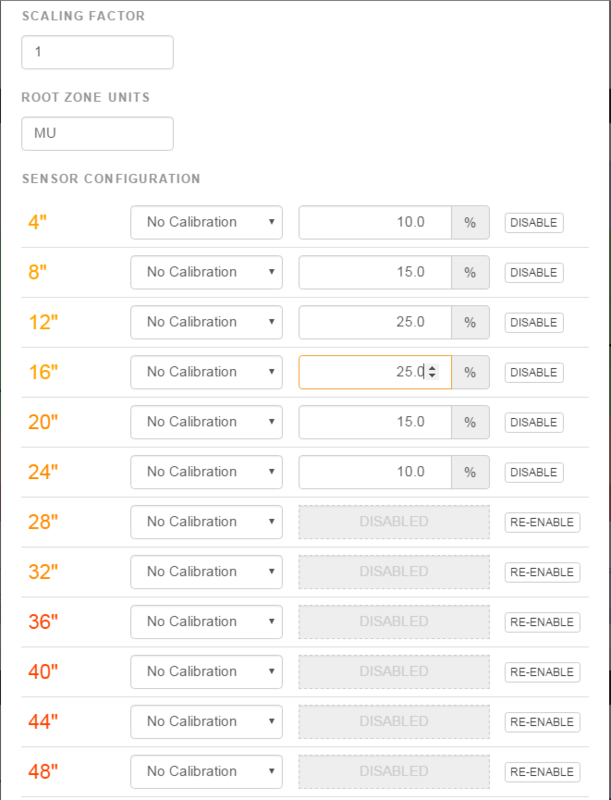 The default setting has all sensors enabled, with each one weighted equally. The percentage of each sensor's contribution to the total is then equal to 100% divided by the total number of sensors. Usually, however, you will only want to use data from sensors whose depth corresponds to the current root zone of the crop being monitored. Sensors in the more active regions of the root zone can be weighted accordingly. If Sum rather than Average is selected, the root zone calculation is based on the total of all selected sensor values (displayed in relative moisture units, MU). Again, sensors located outside the crop's root zone may be disabled. Since annual crops develop larger root zones from season to season, their zone settings should be adjusted accordingly. 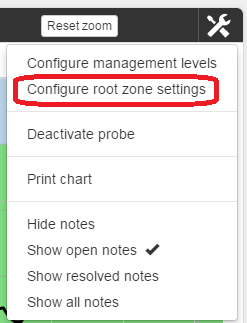 Once the settings for root zone summary calculations have been made, the next step is to configure management levels. When first selected, the program automatically adjusts management levels based on previously recorded minimum and maximum values. In the following chart, the maximum displayed value is below the the top (dark blue) management zone. Upper and lower chart boundaries are easily reset by clicking on the orange Max and Min buttons on the left edge of the chart and simply entering the desired boundary values. 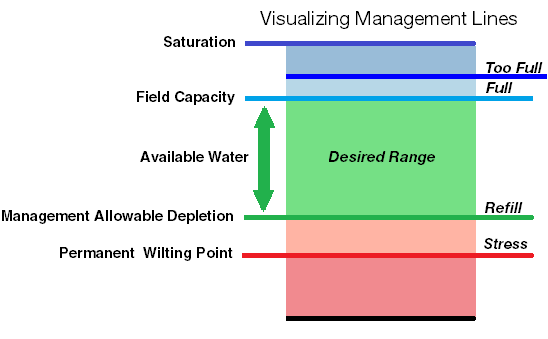 The Management Lines (dark blue, light blue, green and red) define the four initial management levels and their five associated, color-coded, management zones. This feature allows quick adjustments should the data from the root zone summary chart fall above or below the field of view. The objective is to adjust these lines to reflect the following conditions. The levels at which these lines are established should be based upon the analysis and interpretation of the data, in-field inspection of both crop and soil, and well-founded agronomic advice and experience. This feature allows users to apply specific engineering units appropriate to sensors that have been either calibrated or had their data mathematically adjusted to provide a direct measure of volumetric soil water content. The engineering units displayed can then be adjusted accordingly (e.g., mm, %, centibars, or kPa). If sensor is uncalibrated, its raw output is simply expressed in MU (Moisture Units). Since it is the fluctuation of sensor values that has the greatest significance for moisture management, the fact that these rather arbitrary units do not express an absolute value is not an issue. 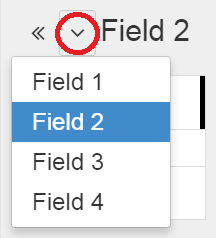 At the end of a season, or when being relocated, this feature makes it easy to take any probe offline. The print chart feature provides an easy way to print the current chart. For multi-depth probes, such as the EnviroPro, the data from all levels or just selected sensors can be selected. Separate-level charts allow detailed analysis of water movement through the soil profile. The rate of change in soil temperature at different depths and the changes in electrical conductivity (when enabled) can be monitored this way as well. Click on the button (hide/show tab) on the left-hand side of the 'SEPARATE LEVELS' bar to drop down a chart of individual readings of the soil probe's multilevel sensors. 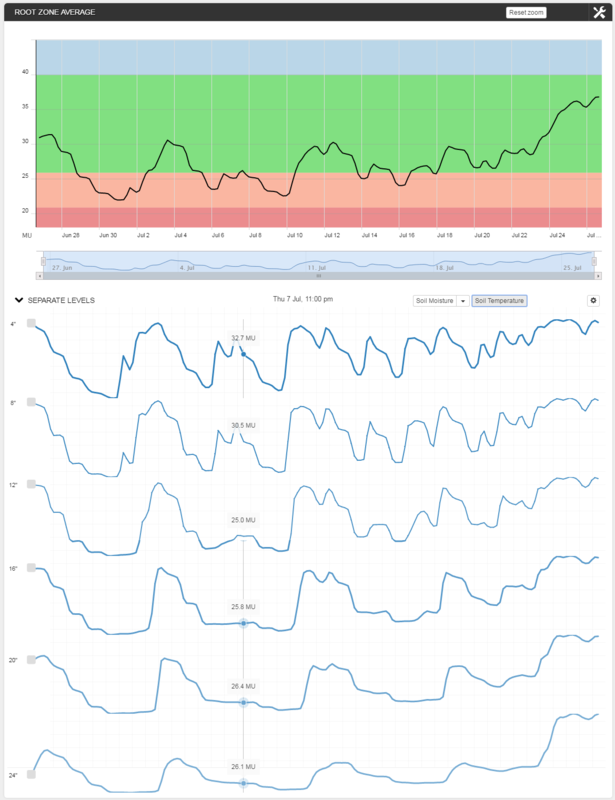 Display separately (the default display) plots each sensor from the surface sensor at the top to the lowest sensor at the bottom of the chart. In circumstances where the root zone does not extend the full length of the soil probe, you may wish to graph data from only the relevant sensor levels. By clicking on the drop-down menus associated with either Soil moisture or Soil Temperature, you can easily 'unclick' any of the sensor levels and only the remaining 'checked' levels will be displayed. You can then assign different 'weights' to different levels of the root zone. Here, since the six sensors at levels beyond two feet are below the root zone, they have all been disabled. The remaining six sensors have been weighted so that the two in in middle of the root zone have over twice the weight of of the two outer sensors. With the 4" and 24" sensors configured at 10%, the 8" and 20" sensors at 15% and the 12" and 16" at 25%, 80% of the combined root zone average is derived from the data provided by the 8",12", 16" and 20" sensors, while the 4" and 24" sensors contribute to just 20% of the displayed root zone status. Here is the resulting display. 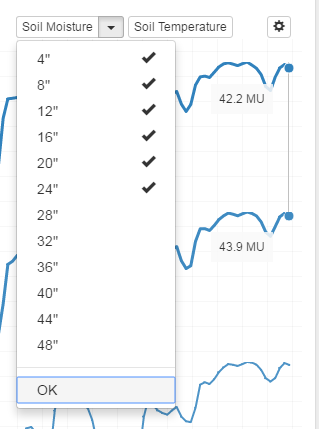 To compare data from different level sensors on the same chart, simply click on the cog icon and choose Display together. For a slightly different and more detailed treatment of Crop Manager's features, including chart pan and zoom capabilities and the display of evapotranspiration (ET) data, see Crop Manager — a Detailed Guide.